Very thin and tasty bread, made without preservatives. Ideal with cheeses, wines, salads or dips. 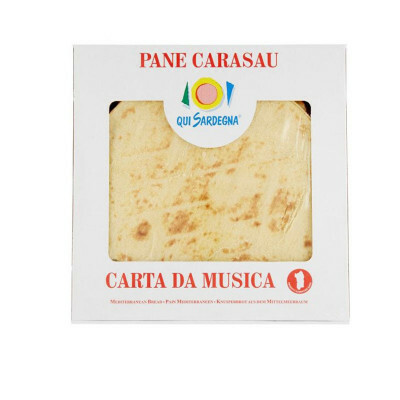 The original recipe of the carasau bread is very old and was conceived for shepherds who used to stay far from home for long time. Made from hard wheat bran, salt, yeast and water. Durum wheat semolina, yeast, water, salt. It contains gluten. Store in a dry place. Once the packet has been opened, close it again, maybe in a bag, in order to maintain the bread fragrance for other 3-5 days.